Manufacturer of EDM Oil & EDM Dielectric Oil. Our product range also comprises of Edm Wire Cut coolant and METAL WORKING FLUID SEMI SYNTHETIC CUTTING OIL. 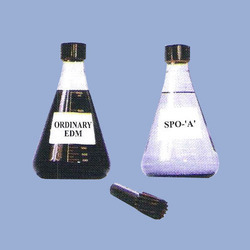 Our sound industry experience of supplying, trading and sub-dealing premium assortment of EDM Oils has encouraged us to present EDM Dielectric Oil to our patrons. It is specially processed for general purpose mold and dies applications involving optimum rates of metal removal, proper flushing and close tolerances. It is low in viscosity to facilitate excellent cooling of electrode as well as work-piece and can be availed at reasonable rates. Looking for EDM Oil ?